Get ready for a bird-tastic FREE RPG adventure filled with “weapons” (whatever they could get a hold of), magic, bad guys and silly hats! 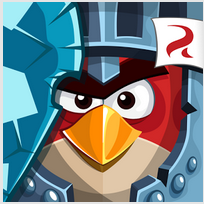 Lead your feathery team into battle now – it’s going to be EPIC!EPIC BATTLES! Turn-based battles between our heroic flock of warriors and those green snout-nosed scoundrels! It’s easy to play, but difficult to master! - Player vs. Player Arena! Battle other teams and defeat their banners! - Customize your team banner with powerful parts! - Win in the weekly leagues for epic rewards! - Climb the ladder in the Arena Leagues – can you make it to the Diamond tier? - Plus, look out for an upcoming special holiday event!